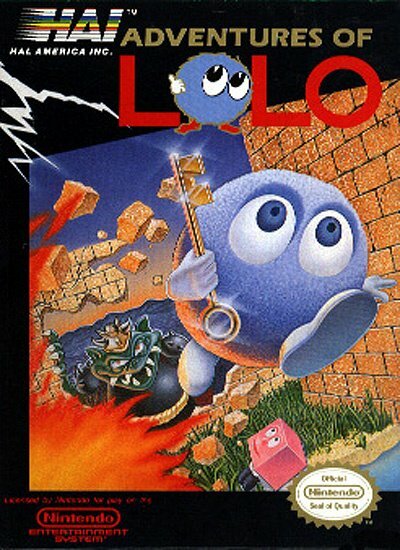 The fine folks over at HAL Laboratory have an affinity for protagonists who could double as pretty decent basketballs, and the often-forgotten NES puzzler Adventures of Lolo features our first example of a blob hero. Unlike the platforming cuteness of the Kirby series, arguably HAL's most famous creation, Lolo has a focus on top-down navigation and some pretty challenging puzzles to solve. Now on 3DS' Virtual Console, how does it fare over 20 years after release? 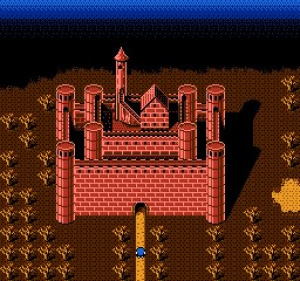 Your blobby pal Lala has been captured by an evil King, and taken to the top of his similarly evil castle; a brief intro animation shows the drama in impressive detail for its time, and then you're launched straight into the action. The setup is far from original, but does the job in outlining a simple objective to contextualize your journey from floor to floor. Let's face it; we're not here for the story. 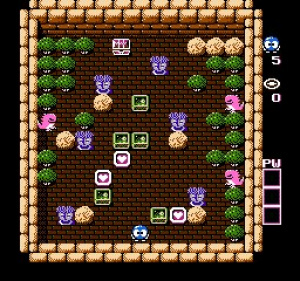 Each level takes place in a single-screen room, where Lolo is tasked with collecting all the hearts and grabbing the treasure before continuing on to the next. 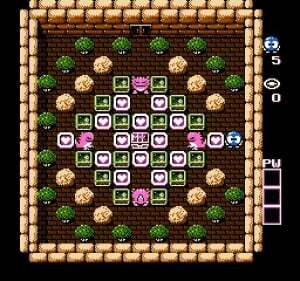 It's reminiscent of the dungeon template from the original Legend of Zelda, so it's no surprise that block pushing will come into play quite often. It's safe to say that our blue hero is a lot less formidable than Link, however, so you'll need to plan your approach to avoid roaming enemies, who can take you out in one hit. Luckily the controls are both straightforward and responsive, so you've only your logic to blame every time you see 'game over'. Chances are you'll make all your initial mistakes and learn how to correct them in the first few minutes, as there are a few quirks to the gameplay that aren't readily apparent at first. Lolo can attack, but only with a limited-use bubble shot, which freezes enemies and turns them into movable objects. Hitting them again will destroy them entirely, but since you'll only ever have two shots at any one time, this is often a risky move. Some enemies remain completely still, blocking your path, while others charge Lolo with unpredictable movement patterns at speeds which we swear are just a little bit faster than our blue buddy can ever reach. A few will actually fire projectiles on sight, and there's even a type which falls asleep as soon as it touches you, creating a Snorlax-esque obstacle to worry about. That's pretty much the general idea, but HAL take those core concepts and isn't shy about turning up the difficulty. While you'll go on to unlock power-ups that allow you to break a single block or cross impassable rivers, the majority of your time will need to be spent considering enemy patterns and attempting to outwit them while collecting the hearts. The manual itself admits that Lolo isn't the strongest or fastest guy around, but "possesses great courage, a high IQ and a lot of patience", which are traits the player could do with having as well! Getting yourself stuck is a common enough occurrence that there's a 'give up' button programmed in to Select, which allows you to reset the level at the cost of a life. Stages don't always have linear solutions, so a little ingenuity goes a long way when it comes to tackling the puzzles. Without the ability to pause mid-level — save for cheating and using the 3DS' 'Home' button — it's all go once you decide to take your first step. Enemies activate at different times, but it's worth standing still before you begin, just to get the lay of the land and prepare. It's the sort of puzzler you can't really blag your way through, at least not once you're a few floors into it. Thankfully, the simple setup means that whether you want a few evenings of mental exercise or simply to dip in and out every once in a while, the portable format fits Lolo like a glove. As for aesthetics, we can at least report that everything is clearly defined and you'll never find yourself getting confused over what's what. The enemy designs run the gamut from cute to bizarre, and each level is basically just a re-arrangement of the last, so the visuals won't impress, but they won't distract either. Chirpy music and fluid animations help round off the experience, although it feels more like a prototype of the kind of charm we've come to expect from HAL. Fun fact: Lolo and Lala were actually re-imagined as block-pushing bosses that feature regularly in the Kirby series. So much for saving the day! Though built upon on a relatively simple foundation of block puzzles and tight controls, Adventures of Lolo offers an experience worth far more than the sum of its parts, and one that's sure to test even the most experienced logic lovers out there. With plenty of content and multiple ways to complete each level, the only substantial obstacle to the fun is a very steep difficulty curve that often reaches maniacal heights. Add on the repetitious nature of the gameplay and you have a title which definitely won't be for everyone, but if you're up for a challenge then you could do far worse than taking Lolo on the go. On the game overview it doesn't list 3DS Virtual Console release dates for each region. This is one of those games I never played. Looks like a perfect fit for an NES Remix game. 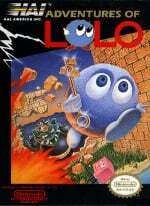 Nintendo, what about Adventures of Lolo 3 for the wii u virtual console? This game is good. I love it. The wii u review gave it a bad score. I don't remember what but I do know a review is in the eye of the beholder. I had a lot of fun with this one on the Wii VC. @DiscoDriver43 They were, and the reviewer states this just before the concluson. Adventure of Lolo 2 was actually the first game I ever purchased (for NES). 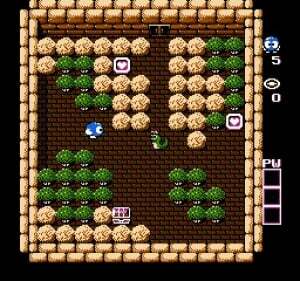 I hated it - slow, boring, and if you got stuck in a stage, you got stuck and could not advance. Of course nowadays you can watch youtube video and find a solution. But, the game is short and you can beat it in no time. Only nostalgia factor makes this game playable. My favorite thing about this game? The BoxArt. I remember renting this at my local videostore and I couldn't advance during stage 2 or 3, because like you, I got stuck. fun times! But you're right, only Nostalgia makes this game playable....And being a total sucker for awesome NES-BoxArt. Chiller and Ghoul School also ring a bell hehe. @WaveWarlock Even nostalgia may make this game playable, my nostalgia does not because my experience with this game was short and frustrating. Has anyone also mentioned that the game also looks bad. Adventure Island (released even earlier in 1986 in Japan) looked much better even though Adventure Island was released earlier. Lolo...he can burn on a stake, and be given eternal damnation!!! Where is Pokemon TCG and Mario Kart Super Circuit? Those should be on 3DS!!! Some people don't know what a good puzzler is and on top of that they don't understand the concept of a different genre. Graphics are not the issue. Game play is. What's a matter can't play cute little adorable Lolo. It's too hard. One of my first games on the Nes. I loved the intro and gamesound. I can still remember it. That says a lot. They need and I REPEAT THEY NEED TO MAKE A NEW ESHOP LOLO. i love puzzle games and this series is one of the best. I'd call a new game "Adventures of Lolo in Kirby's Dream Land".